First, don't panic. There is probably a good explanation for the mystery of the photographs, something that does not threaten the enslavement and/or extermination of mankind. There has to be a benign explanation. I just haven't found it yet. The first photograph appeared in The Washington Post on Dec. 18. In it, the president-elect stands behind and to the side of Condoleezza Rice, his nominee for national security adviser. George W. Bush is slightly out of focus. His head is cocked to the left and tilted slightly backward, his mouth downturned in a perfect cartoonish crescent, the way a first-grader might draw a frown. His eyes are squinty. The next photograph appeared in this paper two days later. In it, the president-elect stands behind and to the side of Alberto R. Gonzalez, his choice for White House counsel. George W. Bush is slightly out of focus. His head is cocked to the left and tilted slightly backward, his mouth downturned in a perfect, cartoonish crescent, the way a first-grader might draw a frown. His eyes are squinty. It is not a similar pose; it is an identical pose. It is not a similar expression; it is the identical expression. Both photos were sent to me via e-mail by Post reader Adam Shannon, and at first I suspected chicanery: that as a joke, Shannon had altered one or both of them in a Photoshop process. But no, Post archives confirmed that both had been published. The president-elect stands behind and to the side of Ann Veneman, his nominee for agriculture secretary. George W. Bush is slightly out of focus. His head is cocked to the left and tilted slightly backward, his mouth downturned in a perfect cartoonish crescent, the way a first-grader might draw a frown. His eyes are squinty. Identical. Different tie, identical pose. Now I suspected chicanery of a different sort. Could The Post have violated its own hallowed standards for accuracy by ginning up these photos from old stock, to cover for lazy or drunken photographers who missed their assignments? Or something? Then the fourth photo appeared. This was in the Philadelphia Inquirer. Bush, with his new EPA chief, Christine Todd Whitman. Cocked head. Backward tilt. Crescent frown. Squint. Then, The Baltimore Sun. The New York Times. The Washington Times. Bush, with his nominee for treasury secretary, Paul O'Neill. Squints! Frowns! First-graders! Tilt! Then, El Nuevo Herald in Miami. °Ceños! °Cortaduras! °Estrabismos! °Cabezas inclinadas! Adopting a background pose of requisite gravity is evidently a tricky thing for a new president: In 1993, when Bill Clinton had to appear beside his new nominees, this very newspaper commented how similar the president-elect looked in the photographs: It was the birth of his famed lip-bite pose. But those photos were fraternal twins of each other. These new ones are clones. What could explain this? It occurred to me that it might not be Bush in these photos at all. The president-elect is a busy man these days, forced by circumstance to collapse his interregnum into a few weeks. Perhaps he hasn't the time to attend all these ceremonial events. Perhaps what we are seeing is a stand-in, one of those cardboard cutouts you can pose with on the street around the White House. 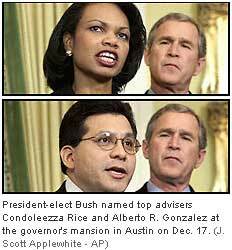 I telephoned J. Scott Applewhite, the Associated Press photographer who took that first excellent picture of Bush and Condoleezza Rice. Is it possible, I asked him respectfully, that he was fooled by a cardboard cutout? "It was Bush," he said. "I am absolutely certain. Otherwise, I wouldn't have said it was Bush in my caption." Hm. I asked: How is your eyesight? "It does the job," he said, a little stiffly. I admit I was pressing, but I was desperate. The only alternative scenario I had was the one I did not wish to visit. Adam Shannon, the Washington communications consultant who first brought this matter to my attention, had a theory of his own: The Bush we know, the Bush we see, the Bush at the debates, the Bush on the campaign trail, the Bush we elected, the Bush whom J. Scott Applewhite and others have been photographing, is "an animatronic robot." "It's a fusion of a servo-motorized biofidelic shell and a sophisticated artificial intelligence module," Shannon theorizes. What we are seeing in these photos, he postulates, is "a machine that has defaulted into standby mode." At a press conference in which attention is directed elsewhere, he said, the robot would "go into a temporary shutdown state in which it assumes a preprogrammed pose while waiting its turn to reactivate and begin speaking." Let's follow this through to its logical conclusion. The most powerful human on Earth is not a human at all but a machine under the control of an unknown master with technological skills far beyond ours, programmed to carry out God-knows-what for the benefit of God-knows-who at the expense of you-know-very-well-who? Oh, man. Desperate for an alternative explanation, I went to our photo files, and found a picture of George W. Bush at around age 7, holding his baby brother Jeb. If you look at this picture just right, you can see the hint of the same downturned mouth, the same squint. I brought this new evidence to Shannon. "Can you authenticate the age of this supposedly old photo?" he demanded. "See, if you were going to create an animatronic robot to run for president, you would have to go back and establish a documentary childhood. So you would have to build and photograph Mini-Me's. This is probably a Mini-Me. Same default posture."